BANFF, ALBERTA, Canada – Looking to really get away from it all and experience the raw beauty of Banff National Park in Alberta, Canada? 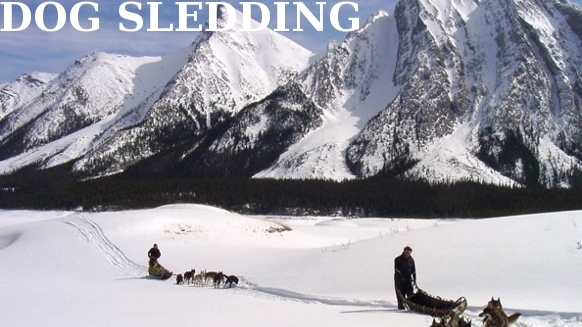 Join us on a thrilling two-day dog sled tour in the heart of the Canadian Rockies. It’s the adventure of a lifetime and guaranteed to be the highlight of your Canadian Rockies vacation! Our Fortune Mountain Dog Sled Tour takes you and your team of huskies to some of the most remote areas of Banff National Park, as well as noteworthy sights such as the Spray Lakes, Canyon Dam and Goat Pond. At night we’ll cozy up by the campfire for a delicious feast of filet mignon, seasonal vegetables and our famous “mystery cookies” as we sip on hot beverages and learn about the natural history of the region. You’ll also hear the native Inuit legends of the sacred buffalo and snowy owl. Bed down with our snug, fur-lined North Face Inferno sleeping bags. It’s a true Canadian Rockies experience! Each morning we’ll wake up early with the dogs to get a good head start. We provide a hot campfire breakfast with fresh coffee and pastries, as well as lunch and snacks throughout the day. Along the way our experienced guides will share their knowledge of the local ecology and history, while our charming huskies provide excellent companionship. We offer an optional visit to our kennel facility at the end of the journey so you can see where our pups are born and raised. Tours leave from our trail head at Spray Lakes at 9 am, returning at 5 pm the following day. Trail length is approximately 80 km. $1500 per guest, minimum of 2 guests. Tour is based on our Exclusive Signature package, which means 2 guests and 1 instructor per sled. Hey! Want to know what the weather is like in Banff, Canmore and Jasper? Check out our live, user-controlled 360° webcams at Rockies.com.